As you may have guessed by now, I have an affinity for food, and I love to cook. For Thanksgiving, my roommates & I have all the "orphans" (friends, coworkers, etc. who are also in the city/not with their families) over to our apartment and we spend plenty of time eating, drinking and catching up. The only requirements are that they have to bring a food dish and a drink option! Last year, I did a crumb top apple pie, dinner rolls and a veggie-friendly main dish for myself...this year, I'll be adding a pumpkin pie to the mix. First thing on my list, though, are those dinner rolls. I made them for the first time last year and everyone went nuts about them (and for the apple pie-it lasted all of 20 minutes. I'll share that recipe later!). I first picked this up through Pinterest and traced it back to How Does She. Her recipe, which you can view in full (with a lot more photos) here, is simple to follow, even if it's your first time working with yeast. If you're feeding a lot of people (or you're like me, and you have several roommates who would love leftovers), a double batch wouldn't be a bad idea. 1. To start out: Scald 1 1/2 cups of milk, 3/4 cup sugar and 1/2 cup of butter, in a microwave safe bowl, for about 2 minutes. Cutting the butter into pieces helps it melt faster. There will probably be some little cubes of butter still floating in the hot mixture, they will melt. 2. We are going to add yeast to this hot mixture, but it will be too hot to just dump the yeast straight in (it would kill it!). To cool it down stir in 1-2 cups of flour, then add 1 egg and 1 Tablespoon of salt, and leave it to cool for a couple of minutes. Meanwhile, in a measuring cup dissolve 2 Tablespoons of yeast in 2 cups of warm water and 1 Tablespoon of sugar. Let it sit for a couple of minutes until it is bubbly. **Keep track of how much flour you are adding, and make sure your mixture is warm, not boiling before you add the yeast mixture! 3. Using a fork or wooden spoon, gradually stir in 9-10 cups of flour (total-counting the flour you have already added to cool it earlier, you should use 9 to 10 cups). I would recommend only adding 2 cups at time and stirring in between. These rolls turn out so much better when they are mixed by hand. 4. At the end the dough will be dense and sticky, and may be hard to stir, you can use your hands to incorporate the rest of the flour if needed. Be sure not to add too much flour. Then smooth the dough out and cover the bowl with plastic wrap. Leave it in a warm place and let it raise til it doubles in size (while you're waiting, butter two cookie sheets and set them aside). 5. Cover your working space with flour to prevent the dough from sticking. Dump your dough out and divide it into 4 balls. Eyeball the sizes, then lift them up and feel the weight of each ball. Try to make them even, but they don’t have to be perfect. 6. Using one ball of dough at a time: roll the dough into a circle on a floured counter. Once it is rolled out spread the top with butter from edge to edge. You will use about 2 tablespoons per circle of dough. Cut the dough into quarters using a pizza cutter, and then each quarter into three triangles (giving you 12 triangles per ball). 7. Roll the dough from the wide end of the triangle. Tuck the tail of the triangle under the roll and place it on the buttered cookie sheet. You will make 3 rows, with 8rolls per row. This will give you 24 rolls per pan. Two balls of dough will fill 1 pan. You will get a total of 48 rolls! 8. Pre-heat your oven to 350 degrees. 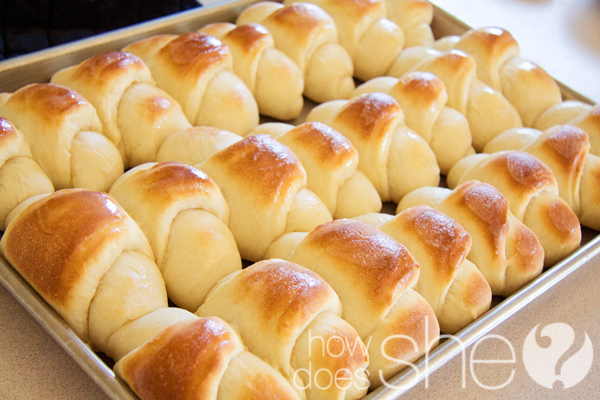 Place the pans of rolls in a warm place (on top of the oven if possible) to let them rise. Once they are touching and full in size, cook (one pan at a time) in the oven ’till they are golden brown. About 10 – 15 minutes, It may take longer depending on how hot your oven cooks. Keep a close eye on your first pan to get the right time for the second. 9. While they are still hot and fresh out of the oven run a stick of butter over the tops of the rolls for a delicious buttery glaze! You can also print out this easy to read PDF of How Does She's recipe. What's your favorite thing to make during the holidays? Share below! The recipe is actually wonderful. It's very tasty and healthy too. I was trying to find such wholesome and tasty recipes. Your blog is in reality very good and it has many healthful foods which have been very smooth to make. thanks a lot for this submit.Go to custom essay writing service to get the expert writers.